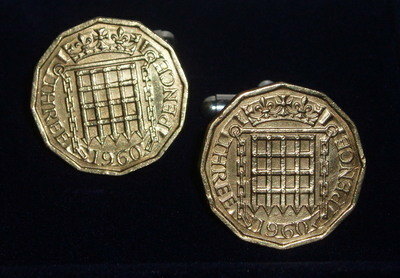 Really quirky and unusual pair of Threepence Coin Cufflinks. Also called Thropence,Thrup’enny bits or Thrupenny. These Handmade cufflinks have two real Thrup'penny Bit Coins mounted on gold plated cufflink backs. Perfect Birthday or Anniversary gift. I can make these cufflinks most dates from 1938 up to 1967, except 1947, please fill in the date box with with your requirements. For 1946 and 1949, please see individual sale listings as these coins are very rare and cost more. Allow up to 10 working days for dispatch as I have to source the coins.